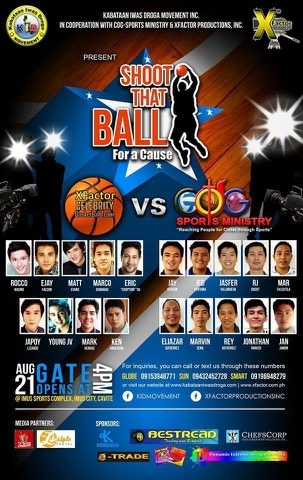 Are you ready for another celebrity basketball?! Well, get ready for another fight this August 21, 2016 at the Imus Sports Complex, Imus Cavite. Rocco Nacino, Ejay Falcon, Matt Evans, Marco Gumabao, Eric "The Eruption" Tai, Japoy Lizardo, Young JV, Ken Anderson, and Mark Herras will compete against the players of the COG Sports Ministry! This event dubbed as "Shoot That Ball for a Cause" is brought to us by XFactor Production in cooperation with Kabataan Iwas Droga Movement. For inquiries on how to avail your tickets, you may send us a message in our Facebook Fanpage or you may contact the numbers on the poster above.